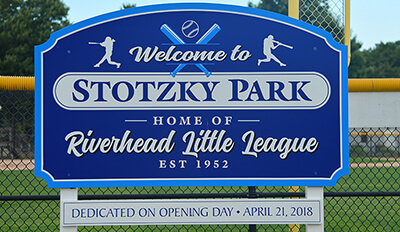 Riverhead Little League operates in Suffolk County located on the east end of Long Island, NY. At Elmer Stotzky Memorial Park we have two baseball fields, three softball fields, a tee ball field, batting cage, a concession stand and a playground. Although we call Stotzky Park home we also have utilized the fields at Veterans Memorial Park (Calverton) and Iron Point Park (Flanders). Field information and directions are listed below, please contact us if you need additional information.